Identity/Class: Human transformed by magic. Powers/Abilities: Able to transform from his teenage form into (an apparently slightly older) superhero form when he draws Excalibur from it's stone sheath. In his transformed state, the Sword has the strength of "many times ten" men. History: Arthur Lake was the son of industrialist John Lake, president of the Lake Aircraft Company. Accompanying his father on a business trip, the scrawny Arthur discovered the tomb of King Arthur, complete with the fabled sword Excalibur sheathed in a stone. Pulling the sword out, he gained superhuman powers, which he used to fight Nazis, saboteurs and the weapon's ancient enemy, Morgana, as the superhero "The Sword." Arthur kept Excalibur hidden in a secret spot, where he could get to it in the event of emergencies. 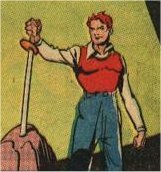 He soon gained a pair of allies, when his friend Lance Larter and Moe Lynn, a worker at his father's plant, gained powers of their own - both Lance and Moe magically transformed whenever Arthur pulled Excalibur from the stone, wherever they might be; Lance became the heroic Lancer, with similar powers to the Sword, while Moe became Merlin. 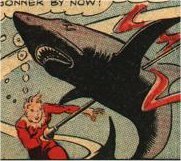 (Captain Courageous Comics #6, Super Mystery Comics vol.3 #3 to vol.5 #3, Lightning Comics vol.3 #1) No synopses available. Comments: Image used on bottom right of this page courtesy of Darrin Wiltshire's Micro Heroes site, used with permission. Thanks to Joe Bromhead for information on this character. 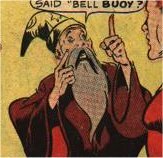 Thanks to Jess Nevins for allowing me to use information from his excellent Golden Age Heroes Directory. 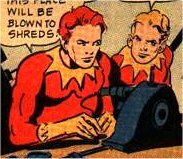 Thanks also to Richard Boucher & Darrin Wiltshire @ PR-Publications for permission to use information from their equally brilliant collection of Golden Age Sites, PR Publications. Their knowledge of Golden Age characters far outstrips my own. Powers/Abilities: Superhuman strength. Armed with a magical lance. 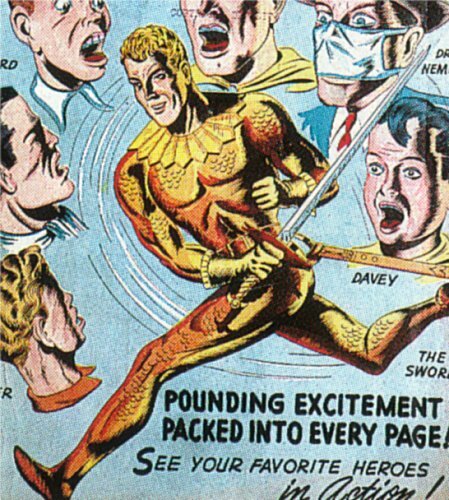 History: Whenever his friend Arthur Lake draws the sword Excalibur to transform into the hero known as the Sword, Lance also transforms, becoming the Lancer. History: Exposed to the same magic which transformed young Arthur Lake into the Sword, plant worker Moe Lynn became Merlin.